The master bedroom is your personal sanctuary. It’s the place where you can shake off the stresses of the day and unwind in whatever way you see fit. So, it makes a lot of sense for this area of your home to be more customized than rooms that are commonly shared with the rest of your family and visiting guests. To make sure that your bedroom design is serving your needs in the best way possible, read on for some tips to make sure it’s potential is maximized. Your choice in flooring can affect the quality of your sleep. Allergens can become trapped in carpet and aggravate existing conditions. Who can sleep well while sneezing? Instead, choose a surface that won’t allow these allergens to hide. 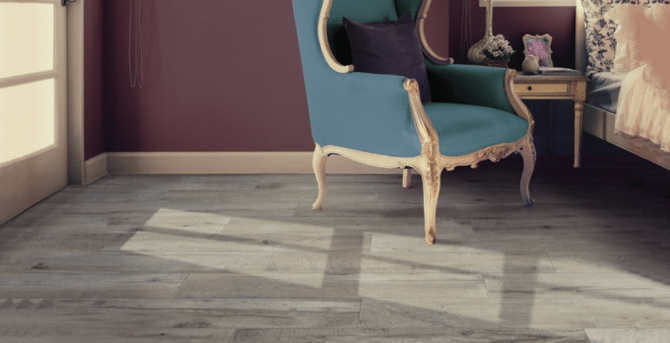 Wood-look tile in a distressed or worn pattern gives your entire space an aged look that helps to unwind your stresses at the end of your day. Another benefit to using tile is the option to add a floor heating system with a programmable thermostat. This feature ensures your feet will be comfortable as soon as they hit the floor. The color scheme of the room is the first thing that will create a sense of calm upon entering. Be sure to choose a relaxing neutral or cool color for your most dominant hue. Warm colors such as red and orange represent activity and wakefulness—not exactly what you’re looking for in a room where you want to catch some quality sleep. Instead try a cool gray or blue on the walls since this space will account for most of the surface area in the room. If you enjoy bright colors, you can still inject them into the design through accents such as pillows, artwork or the base of a nightstand lamp. But again, this room is all about alleviating the burdens of the day, so be gentle with your color choices. The right lighting is essential for resting your eyes after a long day. Be sure to install light bulbs that emit warm white light, which will be softer on the eyes and better transition them for lights out later in the evening. When the lights are on, however, using a dimmer switch is recommended. This way you will be able to customize the brightness of the room to coincide with your activities. Reading a book will require bright light while catching up on your favorite TV show with a glass of wine handy will not. The more options you have, the more customized the space feels. Place the items in your bedroom that bring you satisfaction. If that is a large screen television or a leather armchair and floor lamp for reading, then so be it. This space is all about what makes you happy and helps you feel good at the end of the day. Only allow items that bring you joy into the room. The flip side of this idea is to keep what you have in the room organized. Once you have all the things you need, do not clutter up the space with unnecessary extras. It is worth it at the end of the day to enter your personal sanctuary and have it clean and ready to receive you.